Losing your wallet — or worse, having it stolen — is stressful, not just because of the worry of identity theft but also because your left without your identification and methods of payment. One thing you can do to make it a little less stressful is keep a list of everything in your wallet, along with the customer service number for each so that you can have it canceled or replaced. Many people suggest making a copy of the front and back of each card, which is a great way to keep track of it. Another option is to keep a list of all of that information in one place. Jill emailed and asked if I could create a printable that she could use to keep track of her wallet contents. I absolutely love this idea, and I tried to make this one as flexible as I could so that it will work regardless of what you keep in your wallet! 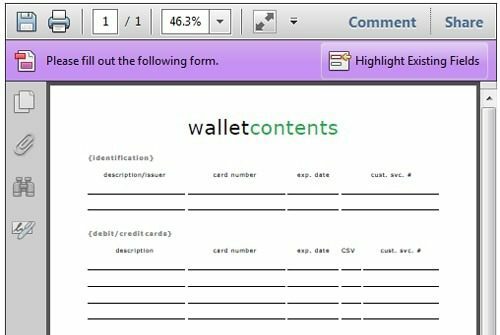 Click here download or print the free wallet contents printable.